Mathematical instruments have been in use since the beginning of civilisation. They were in use at the time of building of Babylon and were well known to the Egyptians. The earliest surviving examples date from Roman times. During the renaissance they were developed in form as objects of both function and beauty. Instruments of this date, however, rarely appear on the market today and are generally only to be seen in the major museums in Britain and Europe. By the middle of the Georgian period they were in common place use and it is from this time forward that they can be found and purchased for a reasonable sum. The best instruments continued to be hand made to very high standards until the early years of the twentieth century and to be both functional and pleasing to the eye. I have been collecting mathematical instruments for over twenty years now and continue to be fascinated by them. In spite of the fact that my profession was that of Mechanical Engineer, I continue to come across instruments that I have not seen or heard of before. Of course many mathematical instruments were aimed at professions other than mechanical engineering, such as surveying, architecture and navigation. 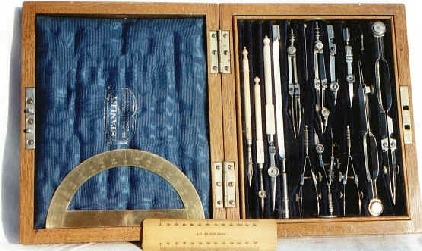 A fine set of traditional English drawing instruments by W F Stanley, one of the most renowned of British manufacturers, in an oak, two-tier case. The set dates from the mid-twentieth century, a late example of this style. The principal metal used is electrum (an alloy of copper, nickel and zinc). The pen handles are ivory. I also collect a few examples of other types of scientific instrument, such as microscopes, telescopes, hydrometers and pedometers - in fact anything that takes my fancy and is reasonably priced. Because some instruments could be grouped under other subject headings I have added a Cross Reference Table with links to relevant pages, for instance for Surveying items and for Military items. I belong to the following societies and can thoroughly recommend them for the wealth of knowledge amongst their members, their events, and their excellent publications. Lastly, why not buy a copy of my book?